YouTube is refusing to reinstate the account of political firebrand Gavin McInnes — despite the fact that the copyright infringement claim against him was fraudulent. A copyright claim was made against McInnes by Yellow Brand Protection on behalf of Vans, which lead to his ban from the platform on Monday. When emailed by McInnes, however, the company said it was a mistake. After McInnes was informed that his account was suspended, YouTube told him he would need to take it up with the company, which he did. “We apologize for any inconvenience this has caused you. Please let us know if your content is not back up within the next 24-48 hours,” the email to McInnes continued. When McInnes responded asking what “submitted in error” meant, the company claimed it was a “mistake” in their system. I can assure you this was not intentional. We are a brand protection company. We are not in cahoots with Vans, Inc. We are not trying to sabotage your career. This was a mistake in our system that grouped your video URLs into our enforcement by mistake. Can you please confirm if your videos have been reinstated? If not, we’d like to follow up with Youtube right away to get this resolved. 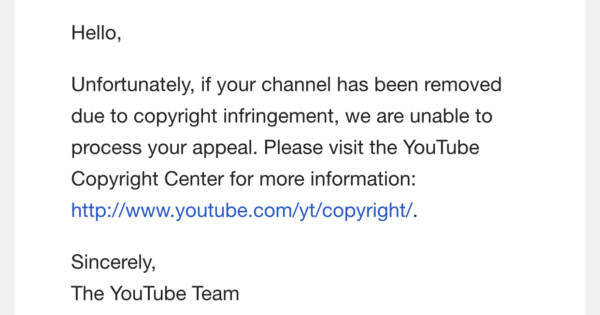 Yet, when McInnes went to appeal the ban — YouTube did not care that the copyright claim was done in error and refused to reinstate the account. “Hello, Unfortunately, if your channel has been removed due to copyright infringement, we are unable to process your appeal. Please visit the YouTube Copyright Center for more information,” YouTube said in an email responding to the retracted copyright claim. 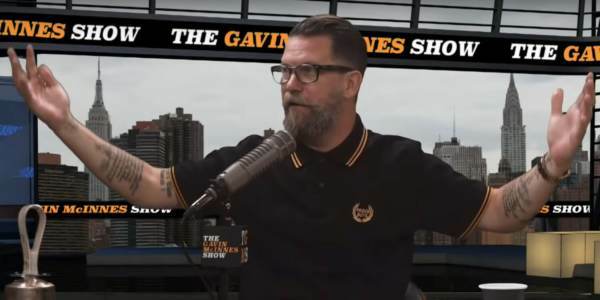 McInnes believes that it is likely that Vans wasn’t even actually involved in the effort to finish deplatforming him. He has already been banned from Twitter, Instagram, Facebook and lost his show at CRTV. “I filled out all the forms correctly and YouTube comes back with ‘we are unable to process your appeal.’ Something very weird is going on here. I wouldn’t be surprised if Vans didn’t even know about this and it was someone else. It could also just have been someone at Google who was told to get rid of me,” McInnes told The Gateway Pundit. Recently, Democratic activists who masquerade as journalists claimed that the FBI had designated The Proud Boys, the social club founded by McInnes, an “extremist group.” It was revealed last week that it was a lie. YouTube, McInnes explained, was the last platform he had left to defend himself from the libel and smears by leftist media.